The South Farm Showcase, a free, family-friendly event, brought thousands out to the South Farm Research Center, in Columbia. Attendees could stop by the more than 60 venues set up throughout the Center and Jefferson Farm and Garden. The focus of the event is sharing the fun and excitement of science and discovery with the public. The University of Missouri College of Agriculture, Food and Natural Resources was on full display during the 12th South Farm Showcase, which was held on Saturday, Sept. 29. The free, family-friendly event brought thousands out to the South Farm Research Center, in Columbia. Attendees could stop by the more than 60 venues set up throughout the Center and Jefferson Farm and Garden. The focus of the event is sharing the fun and excitement of science and discovery with the public. This year’s event highlighted CAFNR’s diverse agricultural work. Each of the six CAFNR divisions – animal sciences, biochemistry, applied social sciences, food systems and bioengineering, plant sciences, and natural resources – were represented. The South Farm Research Center was divided into three main areas with activities at each spot. Main … Expand ▸The South Farm Research Center was divided into three main areas with activities at each spot. Main Street included a variety of programs, including the Taste of Mizzou tent, Alisha’s Pink Pumpkin Painting Party, mule rides and a sunflower maze. 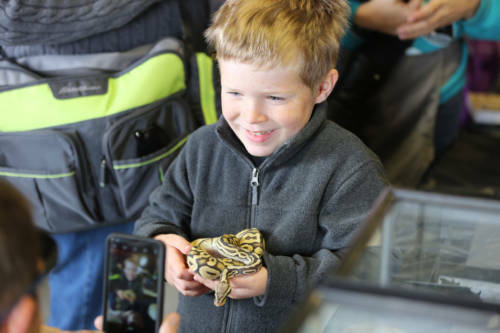 There was also a herpetology area that included snakes, lizards, frogs and geckos. The South Farm Research Center was divided into three main areas with activities at each spot. Main Street included a variety of programs, including the Taste of Mizzou tent, Alisha’s Pink Pumpkin Painting Party, mule rides and a sunflower maze. There was also a herpetology area that included snakes, lizards, frogs and geckos. The turfgrass area gave attendees the opportunity to fly a kite, putt on a green and learn about the different type of grasses. The Equine Teaching Facility was home to several animals, including horses, pigs, sheep and cows. Guests could milk a cow, watch the foal parade, learn more about hawks and pet a pig. Jefferson Farm and Garden was home to several more activities. There was an opportunity to fish, sit in tractors, walk through the butterfly house and smash pumpkins. For a closer look at South Farm Showcase, visit: flickr.com/photos/cafnr/albums/72157696099557970.